Rudranath (Sanskrit: रुद्रनाथ) is a Hindu temple dedicated to god Shiva, located in the Garhwal Himalayan mountains in Uttarakhand, India. Located at 3,600 metres (11,800 ft) above sea level, this natural rock temple is situated within a dense forest of rhododendron dwarfs and Alpine pastures. The temple is the third temple to be visited in the Panch Kedar pilgrimage circuit, comprising five Shiva temples in the Garhwal region. 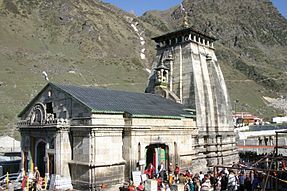 The other temples in the circuit includes: Kedarnath and Tungnath to be visited before Rudranath and Madhyamaheshwar or Madmaheshwar and Kalpeshwar to be visited after Rudranath. The face (mukha) of god Shiva is worshipped as "Nilkanth Mahadeva" here. Trek starts from Sagar village which is approx 03 km from Gopeshwar. The other trek starts from Mandal which is 12 km from Gopeshwar. This trek goes through Anusuya devi temple. Trek is very hard with a distance of approx 24 km. The Rudranath temple is believed to be established by the Pandavas, the heroes of the Hindu epic Mahabharata. Legend has it that the Pandavas came to the Himalayan mountains in search of god Shiva, to redeem them of the sins of killing in the epic Kurukshetra war. God Shiva did not want to meet them and left in form of a bull in the ground and reentered in parts in the Panch Kedar places: the hump raising in Kedarnath, the arms appearing in Tunganath, the navel and stomach surfacing in Madhyamaheswar, the face showing up at Rudranath and the hair and the head appearing in Kalpeshwar. In winter, a symbolic image of Shiva is brought to Gopeshwar for worship. The Doli Yatra starts from Gopeshwar via Sagar. The Doli Yatris cross Lyuti Bugyal and Panar and finally reach Pitradhar. The worship of ancestors is done here. Then, after crossing Dhalabni Maidan, the Doli or the symbolic image of Shiva, reaches Rudranath.Here first the Vandevi is worshipped. The local belief is that Vandevi protects the area. The Kheshtra is protected by Vandevi or Vandevatas. The temple celebrates an annual fair on the full moon day in the Hindu month of Sravan (July–August) that is mostly on the day of Rakshabandhan. The fair is attended mainly by locals. The priests at the Rudranath temple are Bhatts and Tiwaris of Gopeshwar village. At Nandikund (2,439 m or 8,002 ft), on the trekking route to Rudranath (if coming via Madhmaheshwar), devotees worship old historic swords protruding from the rocks, believed to be of Pandavas. There are numerous sacred water tanks ("Kund") near the temple. These include Surya-kund, Chandra-kund, Tara-kund, Mana-Kund etc. Nanda Devi, Trishul and Nanda Ghunti are the famous mountain peaks, which provide the backdrop to the temple. The holy river Vaitarani or Baitarani or Rudraganga flows near the temple, which has a grey stone idol of Rudranath. The river is identified with the "river of salvation", where souls of the dead cross to reach the other world. Thus, devotees visit Rudranath to perform rituals of the dead, such as performing a pind offering. Some believe that offering a pind to ancestors here equals offering a hundred million at the holy city of Gaya. The mountain peaks of Trisul, Nanda Devi, Devasthan, Hathi Parbat and Nanda Ghunti are visible from Rudranath. The name "Rudranath", literally means, "Him who is Angry." The mountain cave of Rudranath was modified into the temple we see today. The nearest airport is Jolly Grant, Dehradun (258 km or 160 mi). 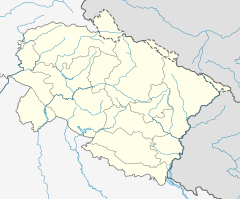 The nearest railway station is Rishikesh (241 km or 150 mi). Most trekking routes to Rudranath are from Gopeshwar or nearby places. A motorable road is present up to the village Sagar that's a hotel rudra for stay — 5 km (3 mi) from Gopeshwar, beyond which a 20 km (12 mi) trek has to be undergone to reach Rudranath. The trek winds through tall grass, oak and rhododendron forests. The trek path is stated to be slippery. Other routes include: an uphill, 17 km (11 mi) trek from Gangolgaon — 3 km (2 mi) from Gopeshwar — through the forest and Panar and Naila shepherd settlements. Another trek route from Gopeshwar to Rudranath passes via Mandal (13 km or 8 mi) and then additional 6 km (4 mi) to the Anusuya Devi temple and then another 20 km (12 mi) to Rudranath. The Anusuya Devi temple is home to goddess Anusuya, who is believed to help devotees in distress. A 45 km (28 mi) trek path is available from Joshimath via Helang too (considered a strenuous trek). There's also a trekking route to Rudranath from Kalpeshwar, via Dumak, Kalgont Kimana and Palla. The route meets at Urgam village, a little ahead of which is Kalpeshwar. ^ a b c d "Rudranath Temple". Part of "National portal of India" (Govt. of India). National Informatics Centre, District Uni Chamoli, Uttarakhand. Archived from the original on 25 December 2008. Retrieved 15 July 2009. ^ a b c "Panch Kedar: Rudranath". Shri Badrinath -Shri Kedarnath Temple Committee. 2006. Retrieved 16 July 2009. ^ a b c d e Harshwanti Bisht (1994). Tourism in Garhwal Himalaya. Indus Publishing. pp. 84–86. ISBN 9788173870064. Retrieved 5 July 2009. ^ Jha, Makhan. India and Nepal. M.D. Publications Pvt. Ltd. p. 143. ^ "Panch Kedar – Rudranath". Retrieved 15 July 2009. ^ a b c Bansal, Sunita Pant. Hindu Pilgrimage. Pustak Mahal. p. 105. ^ a b Bradnock, Roma (2000). Indian Himalaya handbook. Footprint Travel Guides. pp. 114–5. ^ Sharma, K P (1998). Garhwal & Kumaon. Cicerone Press Limited. p. 83.